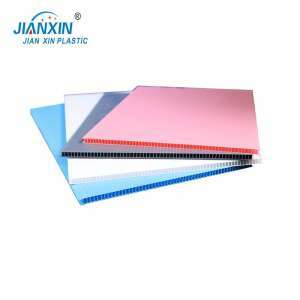 Description Jianxin China custom corrugated plastic sheets manufacturer has been dedicated to providing high-quality custom coroplast sheets wholesale for global brands, companies, and distributors since 2003. Due to the rich industry skill and experience, coroplast products our factory produced have been quite popular in the UK, USA, Canada, and France market. Know about Corrugated Plastic Sheets: also known as correx sheets, polypropylene corrugated sheets, fluted polypropylene sheet panels, coroplast boards, corflute sheets, pp corrugated/fluted sheets, pp hollow sheet/rolls. Being lightweight, waterproof, reusable, and print friendly, coroplast sheets lowes are widely used in buildings, packaging, medical, signage, construction sites, and promotion display. Professional OEM/ODM service: Jianxin pp corrugated sheet manufacturer offers fully customized corrugated plastic sheets and corrugated plastic rolls manufacturing service. Min order quantity: 500pcs per design. Various types: round, square, S shape, etc. Selective thickness: 2mm, 3mm, 4mm, 5mm, etc. Various sizes: 4×8, 48 x 96, 24×48, 1×1.2m, 18×24 or other custom cut-to-size sheets. Available colors: clear, white, red, black, blue, yellow, orange, green, purple, etc. Competitive wholesale price(based on specific order) and highest quality assured. Here are some of our past work. If you want to wholesale custom correx board in bulk from Jianxin corflute sheet supplier, please contact us now!